Over 50 ships, motor boats, and military vessels have arrived at the Northern Capital in order to participate in the International Maritime Defence Show (IMDS). The Press Service of the Ministry of Defence of the Russian Federation announced that at the Show will be exhibited ships of new generation, such as: corvette "Stoikiy", small size missile ship 21631, anti-sabotage motor boat "Nahimovets", the mine countermeasures motor boat "Alexandr Obuhov", patrol boat "Raptor", multifunction modular boat 23370, large surveying motor-boat "BGK-2149" and others. All boats are located at the pier of the Marine Terminal and at the nearby areas. 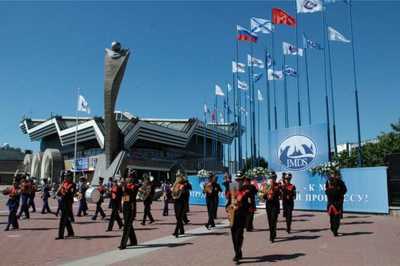 The IMDS is held from 28th of June till 2nd of July in St. Petersburg in multiple locations. One of them is LenExpo Pavillion, as well as the water area of Finnish Gulf and Marine Terminal. Within the Navy Salon framework, the modern inventions will be presented by Russian and Foreign companies. In total, over 400 companies are participating in the event. The military equipment and naval engineering will be on display for the visitors.